A fundamental problem with inspection of families doing elective home-based education: whether or not to believe the parents. I still think that the timescale means that the bill will not have passed through the Lords before the election is called, and if so I expect the HE schedule to be struck out even if some of the rest survives in the washup, but if the Bill does come to the Lords then we, as the unelected house, must concentrate on making it better and not on destroying it. – the expectation that LAs should know about all children in their area who are HE (but no obligation on HEers to tell the LA), and should know that they are being educated. where are the pitfalls for HEers in such a structure? The answer is: in “should know that they are being educated” – in particular the word “know”. That’s a pitfall for LA staff as well as for families. The basic problem is this: It’s not possible to assess either the child’s skills or the child’s education with any accuracy while discounting the parents’ knowledge and expertise. Even a trained person would be pushed to assess an ASD child. All ASD children present differently. There is no one size fits all, so no yardstick for “where they should be at”. Also ASD kids are masters at giving an answer they think the person wants to hear, to get them off their backs. If B was asked questions about his home education, he would refuse to answer (or say “I don’t know,”) because he would only talk about whatever he was obsessing over at the time of interrogation (not what he’d learned months before) or if it is specifically interesting to him for a reason at the time – not if he is asked about it. The assessor would get the idea he knows nothing from that, so we’d get a School Attendance Order straight away. B says he can’t read because he can’t read everything. He can read Harry Potter but to him that isn’t good enough, so his answer to “Can you read?” would be “No.” B rarely shows me what he can do, so no way would he show a stranger, no matter how well trained they were. B would cry if pushed and D would shout. Do you see where this would lead? It is scary. Any inspector of those children would have to choose: Believe Ruth (at least in part) about what her children intend to communicate and what she knows they’ve learned? Or discount her insights, and try to assess the children and their education based only on the children’s own words and what’s visible to the eye? When we’re talking about neuro-atypical children, each child’s uniqueness is perhaps especially obvious. And that helps to make it more obvious that the parent’s background knowledge is essential to interpret the child’s communication accurately. But actually, the same genre of problem arises with many nominally neurotypical children too – especially young and/or emotionally vulnerable ones. Suppose when the inspector asks the child questions, the child stares at the inspector and doesn’t answer. Is this a child who is shy with all strangers? If so, is that because they’re never allowed to socialise? Is it because they were traumatised by their previous experience of school, e.g. bullying? Or are they naturally shy? Are they in fact not shy in general, but they’re wary of this particular visitor (perhaps because they’ve realised that the visitor could force them to go to school)? Or is it just that the questions have been badly phrased and the child is confused about what the inspector wants? Suppose the inspector invites the child to read from a book they’ve brought, and the child refuses. Is this a child who can read well, but will only do it with their favourite people? Is this a child who can read to some degree, but is self-conscious about their mistakes? Is this a child who can’t read? If so, why? Is it because they’re a naturally late reader, who will come to it happily at the age of 10 or 12 and meanwhile is learning loads via other channels? Or is it because their parents have deprived them of all opportunity to read? The child has produced nothing in writing. Does that mean no education has happened? What have they learned verbally or experientially, which left no trace? Well, if this were any ordinary kind of social interaction, the natural thing would be for the parent to interpret the child’s words or actions to the other person who knows them less well. Parents of young children do that all the time. The child seems uncomfortable going into a friend’s house; the parent explains “He’s a bit wary of dogs at the moment, because one jumped up at him in the park”. The child’s enthusiastic about a trip to some seemingly unexciting shops; the parent explains “What she’s really excited about is going on the top deck of the bus”. Or, when the inspector asks about maths, the parent might say “Well, she was very interested for a while in counting up to 100, but she’s bored with that now, and recently we’ve mostly been talking about telling the time”. Will the inspector take the parent’s comments into account? If the inspector is really going to discount everything the parent says, then they’re clearly sometimes going to get badly mistaken results – because children have such varying abilities in making themselves understood, and in explaining the world in which they live. It’s often the parent who can supply the wider context: past history, background which makes sense of cryptic or misleading answers from the child, and so on. But suppose the inspector does trust at least part of what the parent says. How can they possibly rely on the parent’s word, when the whole premise of the inspection is that parents can’t be trusted? I could have stopped this article right there, because I really think the enthusiasts for licensing/monitoring need to meditate on that inherent and fundamental problem for a while. But there’s more which goes along with that. Here’s an uncomfortable reality: No matter how much money you throw at it and how often you “inspect”, it is not possible for the LA to know that all children in EHE are receiving an education that matches their needs. That’s a fantasy world. The real world is not like that. 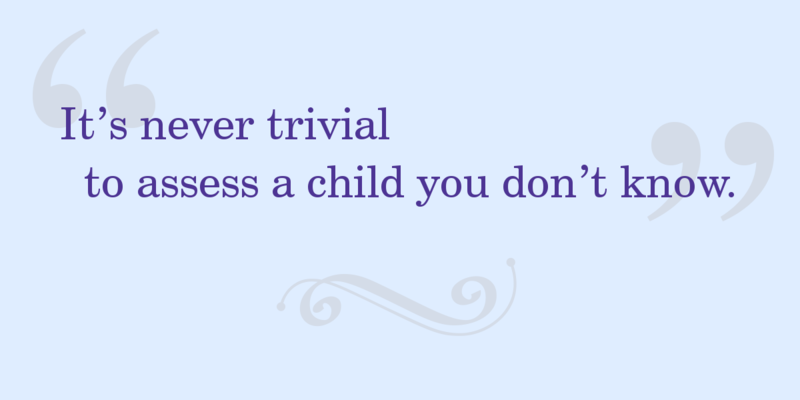 It’s never trivial to assess a child you don’t know. It’s even harder if the child doesn’t want to talk to you. In home-based education, the expected linear progress of the National Curriculum may not apply; the child may have only minimal knowledge in one area, while knowing another area in far more depth than you do, and their minimal knowledge in one area is not a legitimate cause for concern. The child may not have produced any written work; this can be especially challenging for inspectors from a teaching background, who’ve traditionally relied heavily on “marking”. For many children with special needs, even the top independent experts may disagree about what would be best. In a very real sense, the parents of such a child – and, sometimes, the child themself – are the top experts. Even aside from the parent’s in-depth knowledge of their child’s habits and history, the parent’s expertise is currently pretty likely to outstrip the inspector’s expertise in how home-based education works – especially with the more child-led versions. Most inspectors have never done it, and aren’t part of the community which holds years of relevant experience. Someone commented recently that it’s like appointing someone as a driving test examiner who themself has only ever driven a lawnmower! In reality, there is no way to make an accurate assessment of every child while discounting every parent’s input. On the other hand, unless the parents are either (a) of bad intent, or (b) very seriously incompetent in dealing with the world, it’s likely that the child’s education will anyway at least equal what they’d have got in school. Does it seem terribly risky to trust in that? I don’t think the risks are as high as some people fear. Nearly all parents have an immense commitment to doing the right thing for their children; that’s built in to being human. And if a parent can’t muster enough world-interfacing capability to manage the logistics of home ed – e.g. they can’t get it together to ring a stranger and say “what’s on”, they can’t get it together to visit a park or a museum – then it’s likely that they’re already noticeable to the people around them as someone who needs help with life. Even when the parents aren’t doing anything specially wonderful, still the children have a good chance of doing well educationally, simply because of the favourable adult-to-child ratio and the ability to customise to the child. Research shows that parental interest in their child’s education is the single most powerful predictor of achievement at age 16. Someone suggested recently that all the LAs need to know is “These parents seem genuinely committed”. And there’s no reason to suppose that licensing or monitoring or inspection or registration are required in order to offer support. People can be supported by offers of optional resources. People can be supported by better broadcasting of information, without needing to be inspected or monitored – or even listed, if the information’s widely enough distributed. Posters in libraries? Articles in the local free paper? The LAs could do much more to disseminate useful information, at a tiny fraction of the cost of licensing or monitoring. A licensing role for LAs would in many ways make it harder for them to provide support. It’s human nature (as well as in some cases very wise) to put your “best foot forward” to someone who’s assessing you, and play down any problems. Many LAs have already taken it upon themselves to start inspecting us, even though it’s not their job. So how does this “inherent and fundamental” problem of trust get addressed (I could say “papered over”) in daily life? If the inspector doesn’t trust the parent and discounts their interpretations of the child’s behaviour, then it’s anyone’s guess what interpretation the inspector will apply. Now, I’m not dissing intuition. Gut feelings are important. I’d rather trust the gut feeling of a genuinely well-informed, thoughtful, experienced person, than any number of tick boxes. The biiiig catch is that intuitions can be wrong. They can be influenced by personal prejudices, and changed by better understanding. It would be extremely odd if inspectors were miraculously free of all the usual prejudices – class, race, financial status and educational level probably being the main players here. And on top of that, we’ve got the joker in the pack: child-led education, and the way that many teachers and ex-teachers “don’t get it“. I don’t think monitoring would hold many terrors. For the rest of us…	it’s a lottery, with our children’s wellbeing at stake. Expecting the LA to “know” that a child is being educated opens the door to some big problems. It puts the LAs in an impossible position, because (as I hope I have shown) they can’t always know it, independently of the parents’ input; and it puts the children in a terribly vulnerable position, because the LAs can do so much damage in attempting to make sure. I can’t see that there’s actually any point in inspecting families at all if you’re going to believe the parents. It’s a waste of money and time, and the inspection itself may inadvertently do damage to the child’s environment. The whole premise of inspections is that the parents are presumed either incompetent or liars. On the other hand, every time you inspect a family and don’t believe the parents, you run a high risk of forming a mistaken opinion, and causing even more emotional and educational damage than the inspection itself already did. … and should trust the parents to be doing a reasonable job unless there is evidence to the contrary. Posted on 30 December 2009 at 9:07. Copyright © Jennifer Moore 2009. All rights reserved. Sounds about right to me. Thanks for still working on this, I am taking a complete break; totally burned out with it right now. I’ve just found you. Sterling work. Well said. Good, logical thinking. Thankyou so much for taking the time to put this so perfectly. Now we just need everyone to read it! So the answer, it seems, is to stick to the law as it is! Why bring in a complete mess of a law when we have a very well written one already? I hope this blog post is read far and wide. It really explains everything so well. Thanks for this…. I have been banging on about this with Authorities for years. I think you are more articulate than me however!! This phrase “… and should trust the parents to be doing a reasonable job unless there is evidence to the contrary.” is however EXACTLY what the law ALREADY says. Sadly the DCSF can’t even read their own laws and so put this in big neon letters everywhere “Local authorities can make informal enquiries of parents who are educating their children at home to establish that a suitable education is being provided.” from http://www.direct.gov.uk/en/Parents/Schoolslearninganddevelopment/ChoosingASchool/DG_4016124. Until recently I swear they said at every opportunity “Local Authorities have a duty to ensure all children in their area are receiving a suitable education” but this seems to have quietly been removed….except from here http://www.dcsf.gov.uk/everychildmatters/news-and-communications/news/230109niactiontoensureeducation/ where it says “The guidance makes clear that local authorities have a duty to make arrangements to enable them to establish that every school-age child is receiving a suitable education…..” which, by the way, it absolutely does NOT. To the uninitiated all this may seem like liguistic games…..to those on the ground we KNOW there is a world of difference between reacting to the appearance of a suitable ed NOT taking place and investigating everyone fully to “ensure” a suitable ed IS taking place. The former requires training, communication skills and experience, the latter is impossible – so why do they think that the latter is what they should be doing??? Thank you very much for writing this, Jennifer, and thanks to those whose writings you included, for courage, honesty, integrity, insight and truth-telling. Is there any chance I can lift the complete article and send it to my local LA Rep [who is working very hard to ensure the EWO’s do stick to the law] so she can use it as a stick to beat them with if all else fails. @ Jaki – sure, go ahead. Please include the copyright info and the link to the article’s canonical home (this page). Or of course you could just send them the link, depending on how comfortable they are with online stuff. Excellent post! Thank you for such an articulate expression of what I am feeling. FANTASTIC Blog! So spot on. Hadn’t seen this one before. As usual, well thought out and right on the nose. Thanks Jennifer! I’ve just read this again Jennifer and it’s just as good and relevant as the first time I read it. I’m really glad I was prompted to come back to it. Thank you once again for this amazing post and your terrific way of explaining things.